By Kathy Schrock, keynote speaker at the New York Tech Forum on October 22, 2010. 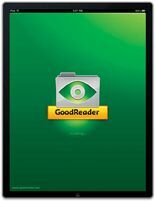 Created by Good.iware, GoodReader is available for the iPhone, the iPod Touch, and the iPad. Some of the add-on features cost money if you are using it on the iPhone or Touch, but the iPad version includes all the features for no cost. CREATIVE USE OF TECHNOLOGY: GoodReader is a great PDF file reader. It can also read Word, Excel, and PowerPoint files. It can hook to MobileMe, Dropbox, box.net, and other WebDAV servers. It can interface with iMap and POP email servers and FTP servers. You can move files up and down with it to and from all these places. You can connect to your Google Apps and Google Apps for Ed documents for easy access and transfer of documents, too. You can download Web pages through Safari for offline reading. You can download and play videos and audio files. GoodReader will also reformat a PDF file as plain text for easier reading. SUITABILITY FOR USE IN A SCHOOL ENVIRONMENT: In a Google Apps school or a district that uses Dropbox, GoodReader can help move files from student to student or from student to teacher as well as get to documents to edit them on the iPad and then send them up again to Google or Dropbox. Without any special software, students and teachers can extract the text in a downloaded PDF document for use in a text editor. This piece of software supports many functions that go on in the K–12 environment: moving files up and down from the Internet, reading from PDF documents and other formats, and editing PDF documents in plain text for use in a project or paper. With its new VGA-out capability a teacher or student can easily share the content in their GoodReader app with the class. It is a powerful piece of software! GoodReader does so much, you will probably find yourself using it all the time. It truly is one of the best $.99 purchases you will ever make for your iPad.